Remember that childhood game of group writing, but only leaving the last sentence for the next writer to continue from? 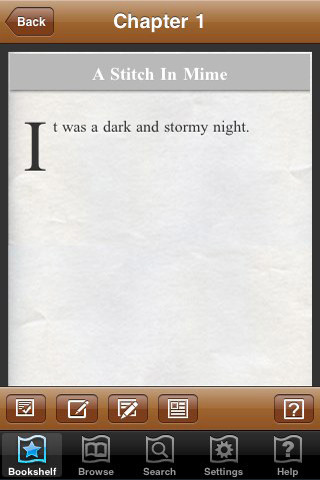 Now you can do something similar, only on a much larger scale with pimplTech.com’s app, iStoryWriter. With iStoryWriter, you can join creative forces with anybody else who has the same app. Once you create an account, you can start your story by tapping Add Stories under the Bookshelf tab and choosing a title and genre (out of seven choices); after that, your story is completely up to you. If you do not create an account, you can only revise other users’ stories, but cannot start your own. Each story is of course made of Chapters, which are separated into Story Sections; each time you save, you make a Section Revision, and if you wish to break up a group of Story Sections, you can designate one a Chapter Start. If other users make revisions to your story, they can choose a Section to edit, and their Revisions will be added to a list of possible revisions. You, as the story’s creator with full revision control, can choose to use any of their revisions at any time by tapping Make Current. You can also stop others from adding to your story by toggling the Section Lock; toggling Is Finished will do the same, as well as indicating that the story is done. There are two ways to look for something to read in iStoryWriter. Under the Browse tab, you can view all stories by genre or just the top 10 most viewed stories. The Search tab allows you to look for a specific story. Once you find a story you enjoy, you can add it to your Bookshelf by tapping the button with a star; that way, you will be notified if that story is updated. Of course, to search or join in on the collaborating and editing, you must have an Internet connection. iStoryWriter is an app that is almost solely dependent upon user-generated content, and as such must also be judged on said content. Sad to say, most of what was viewed was sorely lacking in anything that makes a story: plot, characterization, dialogue, correct grammar/punctuation…I’m really reaching for the bottom of the bucket here, and I’m still coming up on empty. iStoryWriter is a great idea for creating something awesome through collaborative effort, but building that awesome is a difficult task. I understand that it might be a tad hard to write out the next great American novel on an iPhone or iPod Touch, so perhaps a little help by adding a landscape ability–thereby creating a much more enjoyable “typing” environment–would aid users in the long run. The app itself is fairly attractive and rather stately, especially the Bookshelf and Browsing sections: all those faux huge tomes. But without reading the Help section thoroughly, one might be confused by the textless icons floating around the bottom of a story…and even then, might remain so. Does one really need a Show Tag button to display a section’s information when there is a Story Details button that will essentially tell you the same thing? If you really are serious about being a writer, start honing your craft by lengthy practice and considering joining an association’s local chapter–downloading this app is probably not the way to go about it. However, if you want to have a little literal fun and express a little creativity along the way, go for this app. AppSafari review of iStoryWriter was written by Julie Guan on May 13th, 2010 and categorized under App Store, Books, Fun, Reading, Social. Page viewed 3616 times, 3 so far today. Need help on using these apps? Please read the Help Page.